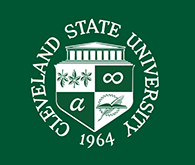 The Cleveland State University Board of Trustees, President Michael Schwartz, and the Library will hold the official unveiling of "Eagle Man," an original bronze sculpture created by the renowned artist, Michael Naranjo. The event will include a reception in honor of the donors, Trevor and Jennie Jones. It will be held on Thursday, November 16, 2006 from 2:00 p.m. to 3:30 p.m. on the first floor of the Library, located at 1860 East 22nd Street. All members of the University community and the public are invited to attend. Michael Naranjo, a Tewa Indian of the Santa Clara Pueblo, lost his sight in Vietnam, but he did not lose his dream of becoming a sculptor. His works are diverse in theme, fluid in their movement, each telling a story all its own. Michael's pieces are included in the collections of The Vatican, The White House, and The Heard Museum. Robert Thurmer, Director of the Art Gallery at Cleveland State University, will discuss the artist and his work during the program. Parking is available at the corner of Chester Avenue & East 24th Street. To reserve a seat or for more information, call 216-875-9734 or email b.florjancic@csuohio.edu. Posted 2006-11-06 13:22:38 by Tracy_Kemp.